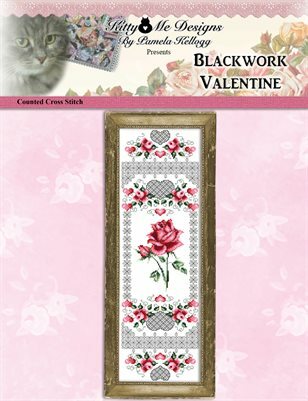 This lovely Blackwork Valentine Cross Stitch pattern would make a beautiful bellpull or framed piece. Designed in 2008 as a mystery stitch along project on my blog. The stitch count is: 72 wide X 246 high. The finished size on 14 count Aida or 28 count Evenweave over 2 fabric threads is: 5 1/8 inches wide X 17 1/2 inches high. Large print, easy to read black/white symbol chart with colored backstitching.